One of my favorite places is outdoors! Cooking outdoors bring a whole new meaning to to the word “cooking”. There is something so very rewarding about cooking with fire, that you created, and coming up with something yummy that you truly made yourself. What better way to reuse old materials than to build an outdoor rocket stove and the possibilities and design are endless. Wh at is a rocket stove? It is a structure that is built with a hollow middle that uses combustion and wood to cook. No electricity needed! It costs less than $50 to build including the metal grates (we are in Texas so pricing may vary). You can use any metal grate whether you purchase one to fit the diameter of the stove or just a used grate lying around. To make your own rocket stove, simply create a base so that it doesn’t destroy your lawn or patio. We used flat cinder blocks, but you can use additional bricks or lay directly on the patio or cement pad if you wish. Create each row with bricks until the desired height by lining up the bricks in a square. Make sure you leave an opening at the base to feed the wood through or your stove will not work correctly. The next row, overlap the bricks making it sturdy. Be sure you do not have a row of seams causing it to become unstable. See picture. Once your stove is complete, testing begins! To feed your stove, gather sticks, twigs, branches, or wood and put in the bottom opening. The easiest way to get the fire started is by using a toilet paper roll filled with used dryer lint. The best part is, that part is free. So be sure to keep saving toilet paper rolls and dryer lint! It is highly flammable and will ignite quickly. Next, put a log or solid piece of wood in the center from the top to create a vacuum and to increase the temperature of the heat. Once the fire is good and started, you are ready to cook! We did not reinforce the bricks together because we currently rent our home. It is movable so you can bring it with you or move to another location. If you desire, you can cement the bricks together to create a more permanent structure. The number one safety rule I cannot stress enough is to make sure your bricks and bonding agent if you choose to make it permanent are fire safe. This stove is fantastic for cast iron pans and cooks really well. It will boil water and cook just about anything. A little tip: This is not ideal for holding pressure if you would like to use this for canning. You would have to build a much bigger stove to generate more constant and consistent heat. Happy Sunday!! Every Sunday, my family has brunch. 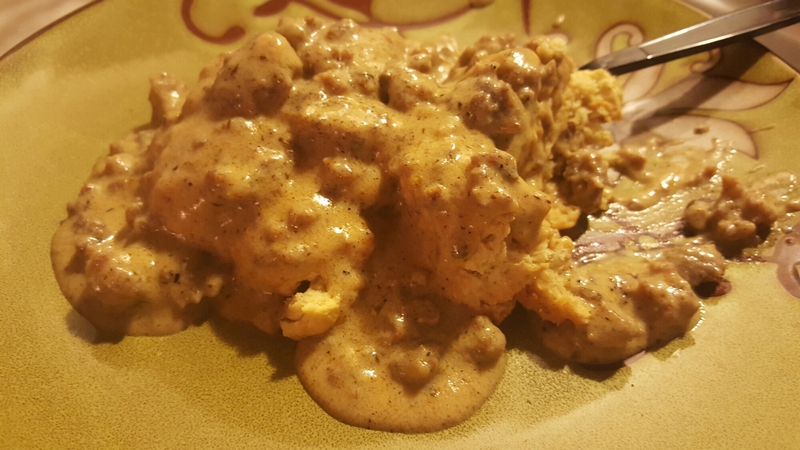 And in our home, it’s biscuits and gravy! 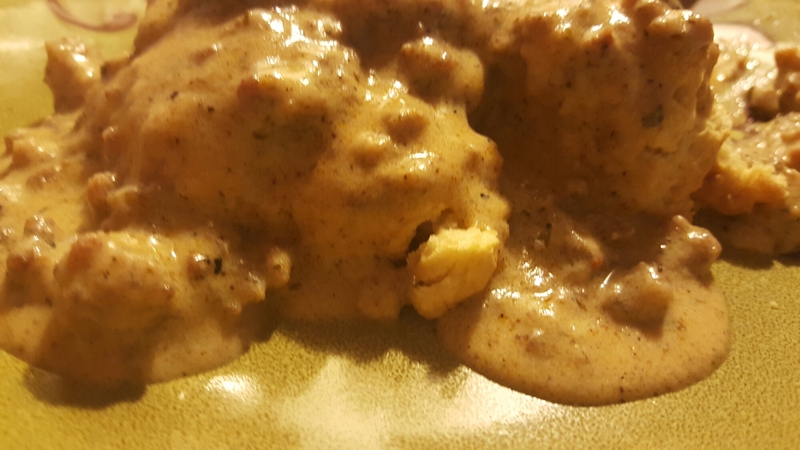 I use a cast iron skillet for both my gravy and biscuits. This will also work and be just as fantastic in a regular skillet and cookie sheet. 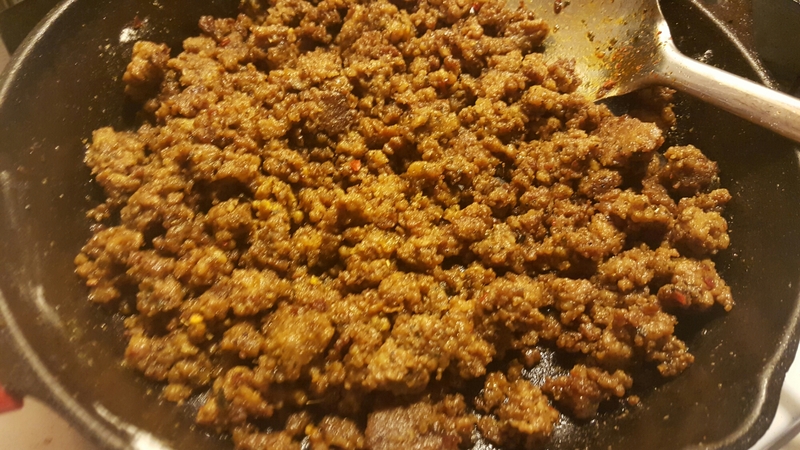 Brown the sausage until it starts to develop a little crispness but just a little. Add seasonings completely to taste. 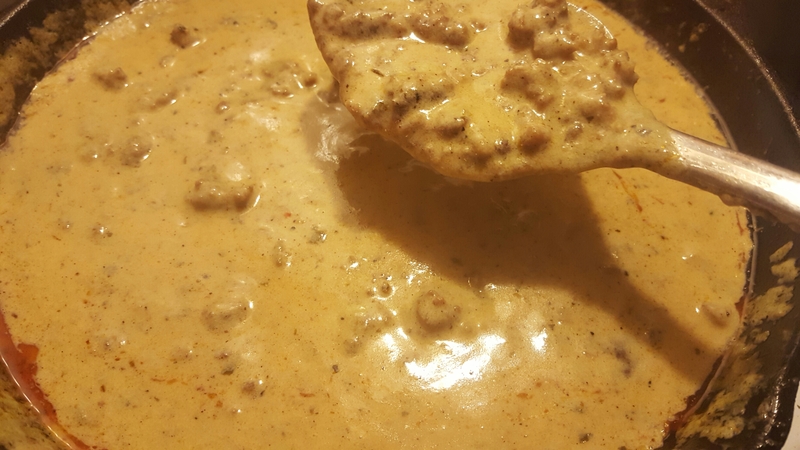 I add a ton of pepper, but it’s very customizable to taste. 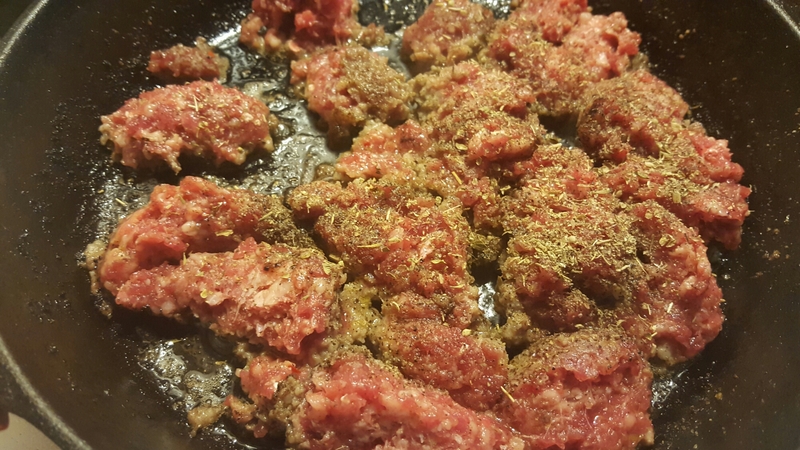 Once browned, sprinkle flour over the meat and stir until coated. The flour absorbes the oil and prevents lumping. This will make a beautiful gravy without a roux so to speak. 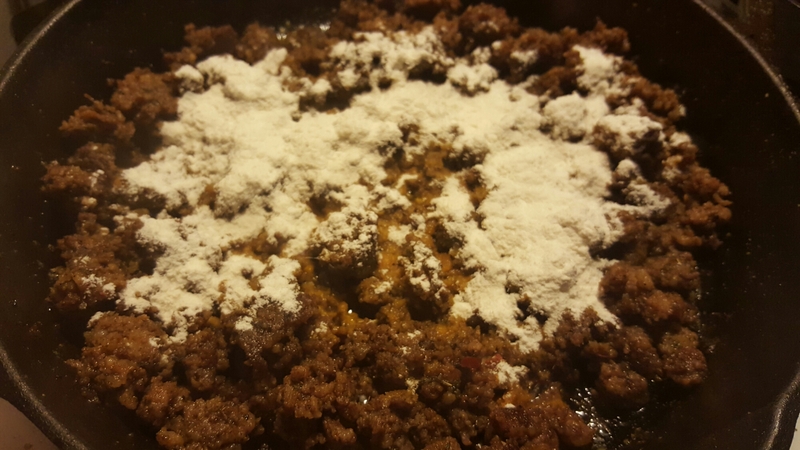 I add about 1/4 – 1/2 cup of flour depending on how it looks. Add milk to almost fill the pan and stir/scrape every few moments so the milk doesn’t scald. 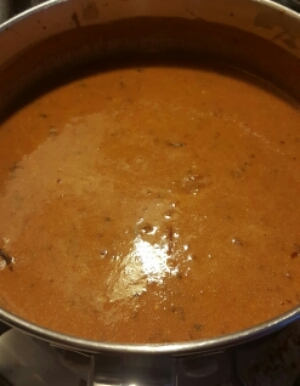 It will thicken nicely as it cooks. Once the desired thickness, I add more pepper and it’s done. 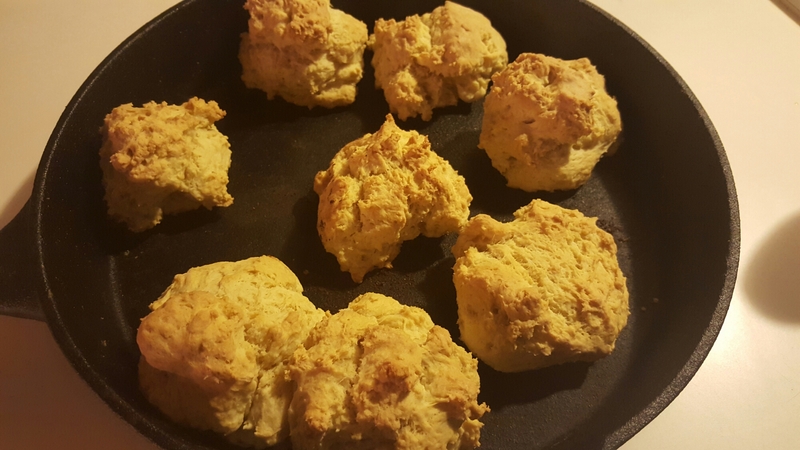 These are baking soda biscuits made with lard. Flaky, soft, and delicious! Combine all of the ingredients except the water. You can use a mixer or a bowl. Add enough water until a dough develops, it will be sticky but not wet. If you add too much water, add more flour. Spoon out on to a cookie sheet, do not roll or form them. If you’re using a cast iron skillet, be sure to heat your skillet in the oven first. Bake at 400 degrees until lightly golden. This keeps very well in the fridge for just a few days. Although if you are like my house, it’s already gone! Enjoy! Mmm it’s chilly outside, we’re lazy in pjs, so why not make the best winter comfort food ever!! 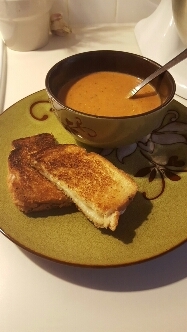 Soup! It’s super easy and takes about 20 minutes to make. You will need two pots. 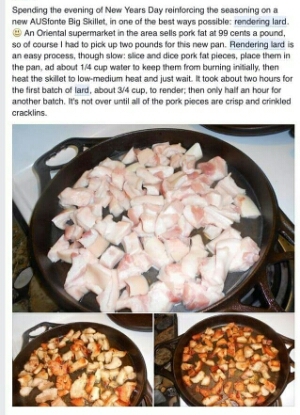 Crisp bacon in a skillet and set aside. 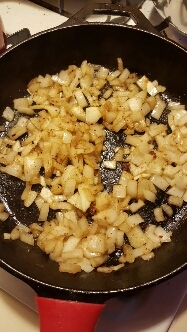 Save the bacon drippings and saute onion until soft. In a large pot, bring to a boil potatoes and chicken broth. In your second pot, melt a stick of butter and add flour to create a roux. 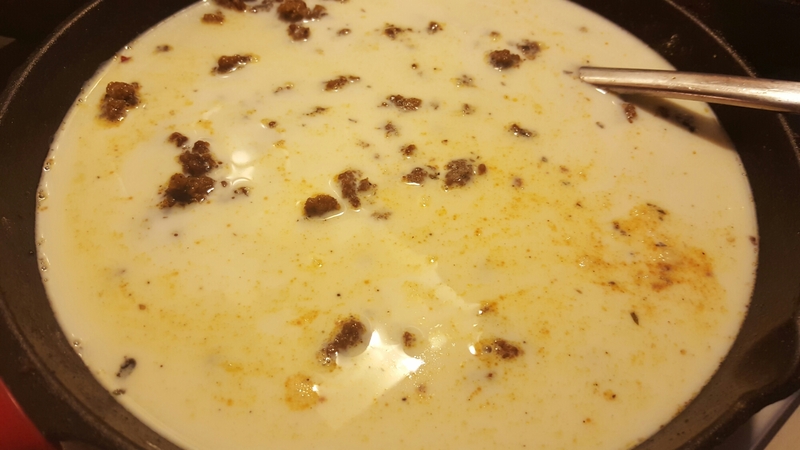 Slowly add 4 cups of milk until thickened slightly. Pour milk into the pot of potatoes and broth. 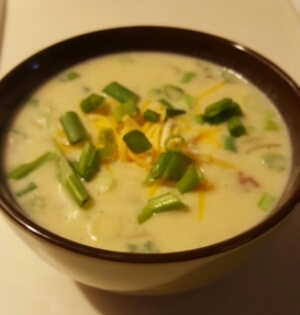 Add cheese, sour cream, onion, bacon, scallion, salt and pepper to taste and simmer for 5 minutes until thickened. 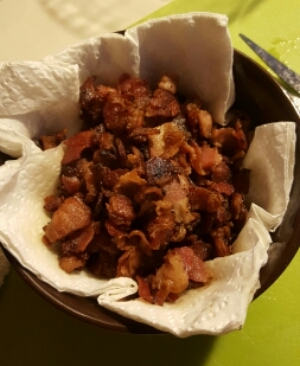 I served bowls topped with a little crispy bacon and shredded cheese. It’s really filling and very easy to make.